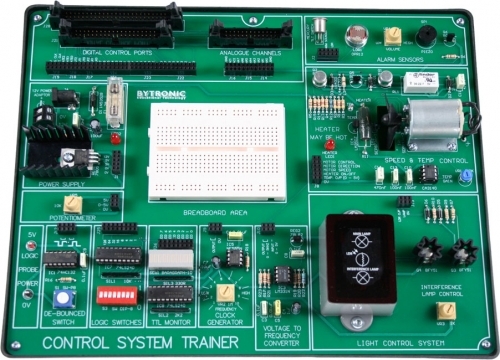 The Control System Trainer (CST) is designed for the study of digital and analogue control engineering using fundamental control theory with simple direct connections or the use of programming software. The CST can be used to carry out the various experiments using the elements and breadboard to design a control application to a specification. Simple or complex experiments are possible by linking the range of devices and sensors on the CST. The CST has two main project areas and a range of digital logic building blocks with a prototyping area. The first project area has a D.C. motor, for speed and direction control combined with a heater for temperature control. Consisting of a 5V dc motor; this is used in a closed-loop to drive a fan that cools a heater to a set temperature or can be used to break an infra-red beam for speed control. The second, main project area is a light control system; a controller is required to maintain a set luminance when an external interference from a second lamp is introduced, it uses two light sources, one source of light and one source of light disturbance. There are a variety of projects to undertake using the range of sensors and devices on the CST. These elements are a bread board area, voltage to frequency converter, light dependant resistor (LDR), a de-bounced switch, a tilt switch, Piezo buzzer, TTL monitor, a bank of logic switches, a logic probe and a clock source. Headers that accept standard solid core wires are used to connect each element of the CST. Connection to a PC is possible using a suitable interface card through digital and analogue connections.